Tobacco smoking is a leading preventable cause of premature death in the USA. Menthol is a significant flavoring additive in tobacco products. Clinical evidence suggests that menthol may promote tobacco smoking and nicotine dependence. However, it is unclear whether menthol enhances the reinforcing actions of nicotine and thus facilitates nicotine consumption. 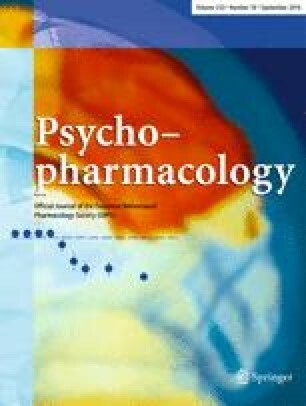 This study employed a rat model of nicotine self-administration to examine the effects of menthol on nicotine-taking behavior. Male Sprague-Dawley rats were trained in daily 1-h sessions to press a lever for intravenous nicotine self-administration under a fixed-ratio 5 schedule of reinforcement. In separate groups, rats self-administered nicotine at four different doses (0.0075, 0.015, 0.03, and 0.06 mg/kg/infusion). Five minutes prior to the two test sessions, menthol (5 mg/kg) or its vehicle was administered intraperitoneally in all rats in a counterbalanced design within each group. In separate rats that self-administered 0.015 mg/kg/infusion nicotine, menthol dose-response function was determined. Menthol was also tested on food self-administration. An inverted U-shaped nicotine dose-response curve was observed. Menthol pretreatment shifted the nicotine dose-response curve to the left. The facilitating effect of menthol on the self-administration of 0.015 mg/kg/infusion nicotine was dose-dependent, whereas it produced similar effects at doses above the threshold of 2.5 mg/kg. Menthol tended to suppress the self-administration of food pellets. These data demonstrate that menthol enhances the reinforcing effects of nicotine, and the effect of menthol was specific to nicotine. The findings suggest that menthol directly facilitates nicotine consumption, thereby contributing to tobacco smoking. This work was supported by the National Institute on Drug Abuse and Food and Drug Administration Center for Tobacco Products (R01DA037277 to X. Liu). The funding source had no other role other than financial support. The content is solely the responsibility of the authors and does not necessarily represent the official views of the National Institutes of Health or the Food and Drug Administration.